In our last post we took a look at the two foundational elements that bound together the independent Myaamia (Miami) villages of the Waapaahšiki Siipiiwi (Wabash River Valley). We found that a common language and a shared landscape helped to maintain a shared identity amongst these villages. We also summarized the extended “family” with whom we peacefully shared our homelands: our close siblings the Inoka (Illinois) and our elder brothers the Ojibwa, Potawatomi, Shawnee, Ottawa, and Wyandot. Outside of our homelands, we found groups that we often made war on: the Osage, Quapaw, Lakota, Dakota, Chickasaw, Choctaw, Creek, Cherokee, and Haudenosaunee (Iroquois). In this post we are going to examine the Myaamia experiences in the early years of contact with Europeans and the massive disruptions of our ancestors’ lifeways that accompanied these new arrivals. During this period, our ancestors were forced to flee from their homelands in order to survive. Together with our near neighbors and relatives we formed an alliance with one group of newcomers, the Meehtikoošia (French). The formation of this alliance required substantial change in our ancestors’ lives, but this new “family” also allowed them to return and rebuild their villages within their beloved homelands. If you look in most books that address Miami Indian history, you are likely to find a story that begins with a series of French names: Médard Chouart des Groseilliers, Pierre-Esprit Radisson, Nicolas Perrot, Jean Nicolet, or Robert de LaSalle. These men were French explorers or coureurs des bois (runners of the forest) involved in the early years of the North American fur trade, and we know of their exploits from their own diaries or from the writings of Jesuit Priests. In contrast to the European record of the early period of contact, very few sources produced by our ancestors have survived to the current day. This makes it very difficult to balance the “outsider” perspective of the French with the “insider” point of view of our ancestors. We must also keep in mind that many of the earliest French visitors did not have a deep familiarity with our ancestors’ language or culture. Many of their observations were made solely from the perspective of French culture. Eventually, French Jesuits did become fully fluent in the Miami-Illinois language and had substantial knowledge of Myaamia and Inoka cultures, but in this early period of disruption and warfare (1640s-1680s) it was the French fur traders who were on the front lines making contact with our ancestors, and it is their notes, their stories, and their point of view that has survived. One Myaamia story that does survive from this period, describes how and where the Myaamia believe they first met the Meehtikoošia (French). The Myaamia word Meehtikoošia is most likely a reference to the wooden boats that the French used to traverse the Great Lakes, and these boats show up in our very first story of the Meehtikoošia. Pinšiwa (J.B. Richardville) and Meehcikilita (Le Gros) recounted the event in 1824. According to this story, the Myaamia first encountered the Meehtikoošia (French) on Lake Huron. The Myaamia and their neighbors the Potawatomi learned of the arrival of a “strange people” on the lake from their elder brothers, the Wyandot. When the Myaamia and Potawatomi “arrived they found four vessels loaded with French.” The Wyandot, Myaamia, and Potawatomi waited patiently and ambushed the French when they came ashore. According to this story, the attack was so successful that the French were forced to flee by setting sail across the lake. The French, however, have no record of this event. It may be that the ambush merely scared the French away and no one was harmed. Perhaps this event was viewed as insignificant by the French and therefore not widely reported or recorded. It is extremely difficult to fix an exact date to this story, but it likely occurred sometime before 1640. This direct contact with the French was not the first time our ancestors felt the effects of European arrival in North America. European contact in the Caribbean Islands and mainland North America began in 1492 and surged in the first decades of the 1500s. As they made contact on the coasts, Europeans set off powerful waves of change deep within the continent among peoples they never met face-to-face. This indirect contact came in the most lethal of forms: disease. Like a monstrous tsunami, European diseases spread inland in powerful waves that overwhelmed populations with no natural immunities. Between 1519 and 1524, the Myaamia suffered two outbreaks of small pox. The Spanish carried this virulent disease onto islands in the Caribbean Ocean and to mainland North America, what is today Mexico. From these locations other indigenous peoples carried the disease with them throughout North America. As communities were afflicted, people tried to flee to protect themselves and unknowingly carried the sickness with them. Small pox, which the Myaamia called meemhkilookinki (a reference to the wart-like sores which cover the afflicted), spreads from human to human by breathing in the virus, which can travel in minute particles of mucus and blood. The disease begins with a fever and eventually progresses to a rash of sores, which can cover the body and even erupt in the mouth and throat. The pain of the disease can be immense and the appearance of afflicted individuals can be extremely shocking. Most shocking of all, death rates from small pox range from 30%-50% and in some extreme cases rates of 90% occurred in a single outbreak. Europeans had been exposed to small pox for thousands of years at home and had some immunity to the disease, but North America was “virgin soil” for small pox and the rates of death were astronomical. In 1633-34, the Myaamia suffered an outbreak of measles, which they called niihpikilookinki (red skin). This illness has lower mortality rates than small pox, but it can still cause death among those who lack immunity. Five years later, in 1639, these same communities were hit with another wave of small pox. Together, these four outbreaks decimated Myaamia villages in the Wabash River Valley. Whole communities may have even ceased to exist. Today, we cannot fully comprehend the horrors that these communities experienced. Our people survived, but stories of these outbreaks were not passed on. We only know of them from the European historical record. The horrors of this period only worsened as these waves of disease were quickly followed by waves of war. Beginning in the 1640s, the five nations of the Haudenosaunee (Seneca, Cayuga, Onondaga, Oneida, and Mohawk) pushed into our ancestors’ homelands with hundreds and eventually thousands of warriors. They came seeking furs – to trade for European firearms and metal tools – and captives to adopt into their home villages in order to replace their own losses from disease and war. These invasions set in motion a sixty-year period of war and disruption. Our ancestors, still greatly weakened from the impacts of disease, were forced to make a difficult choice: remain in their homelands and risk further destruction or flee to the north in order to survive and hopefully recover. Sometime in the late 1640s or early 1650s our ancestors chose to flee. 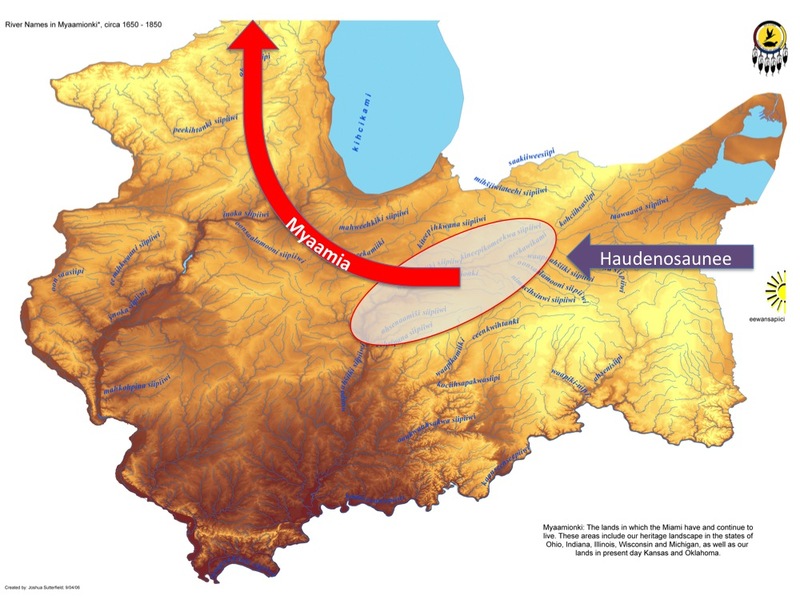 The map shows the Haudenosaunee invasion and the Myaamia exodus from our homelands. They left their beloved Waapaahšiki Siipiiwi (Wabash River) and eventually relocated along the Fox River near what is today Berlin, Wisconsin. This was originally the homelands of the Ho Chunk, who are also known as the Winnebago. In this location the Myaamia built an unusually large village with a population of around 20,000. A typical Myaamia village before this time period may have had a population of 2,000 to 3,000. This village was also multi-ethic and multi-lingual. It contained Myaamia, Inoka (Illinois), Mascouten, and Kickapoo peoples. Some Myaamia people relocated to other smaller villages in the same region, but it seems that this supersized village was the main center of Myaamia organization during this period of exodus from our homelands. This new location presented many challenges. First, the size of the village made it very difficult to feed the population, and the tight living conditions only furthered the easy spread of disease. Second, the village was hundreds of miles north of the Wabash River Valley and as a result the climate was significantly different. Average winter temperatures were 10 degrees lower. Winter also came earlier in the north and the growing season for agricultural plants like corn, beans, and squash was 20 to 30 days shorter. Third, there were hundreds of subtle regional differences in the plants, trees, and animals that our ancestors relied on for additional sources of food. These challenges must have made life in this large village quite a struggle. At this strange moment in our history, we met up again with the Meehtikoošia (French). Unlike our first meeting on the shores of Lake Huron, this meeting was peaceful. The first Meehtikoošia to have sustained contact with the Myaamia was Nicolas Perrot. Perrot was a fur trader and an ambassador of sorts who sought to help unify refugee indigenous groups into a military alliance. His hope was that this alliance could push the Haudenosaunee back to their homelands in the east and allow groups like our ancestors to return to their homes. In exchange, the French would gain access to the fur trade in the region and be better able to protect tribal peoples who had converted to Catholicism and lived nearby the major French settlements. In 1665, Perrot arrived at the village our ancestors shared with the Inoka, Kickapoo, and Mascouten. His original journal has been lost, but the writings of a French historian, Claude-Charles Bacqueville de la Potherie have survived. La Potherie read Perrot’s journals and spoke with him extensively. According to La Potherie, Perrot and his entourage arrived at the Myaamia section of the village, and “the great chief of the Miamis came to meet them, at the head of more than three thousand men, accompanied by the chiefs of other tribes who formed part of the village. Each of these chiefs had a calumet [a decorated pipe]… they were entirely naked, wearing only shoes, which were artistically embroidered… they sang, as they approached, the calumet song, which they uttered in cadence.” After completion of the formal greetings, Perrot was then escorted to the Mascoutens who had the honor of housing him for the night. organized a feast in order to give thanks for Perrot’s visit. Perrot told La Potherie that “[i]n the cabin of the great chief of the Miamis an altar had been erected, on which he had caused to be placed a… warrior’s pouch, filled with medicinal herbs wrapped in the skins of animals, the rarest that they can find; it usually contains all that inspires their dreams.” Perrot told the Myaamia leader that he “did not approve this altar.” He “told the great chief that he adored a God who forbade him to eat things sacrificed to evil spirits or to the skins of animals. They were greatly surprised at this, and asked if he would eat provided they” put away the warrior’s pouch. Perrot agreed and the feast continued. This brief conversation around the “warrior’s pouch” highlights the significant misunderstandings that occur when two or more new groups come into contact with each other. The Myaamia seem to have understood that Perrot desired a military alliance and as such he was probably meeting with a prominent Myaamia neenawihtoowa (war leader). The “warrior’s pouch” that Perrot found objectionable was a symbolic means by which individual Myaamia men demonstrated their willingness to go on the war trail. The “warrior’s pouch” was not a religious object. It was a symbol of commitment. Each man who wished to join the war party would add a token or symbol of his strength to the bag. The bag would then be carried by the war party as it made its attack. Upon returning to the village the contents of the bag would be returned to each man who participated. This act symbolized the end of that particular military effort. The neenawihtoowa (war leader) may have been expecting Perrot to symbolically add his “medicine” to the collective war effort. It must have struck them as odd, when Perrot, who had been calling for war, seemingly declined to participate. In fact, Perrot seems to have misunderstood the situation entirely. He mistook an influential war leader for the akima (village civil leader). Perrot told La Potherie that this Myaamia leader had the ability to command people like a king and from this he concluded that Myaamia akimaki (civil leaders) were more powerful than the civil leaders of other tribes. During times of war, a neenawihtoowa (war leader) often gave direct commands to men who had agreed to fight with him. If they respected his leadership, they would often do as told without hesitation. War and warfare defined the entire period of time that Perrot interacted with the Myaamia (1665-1701) and as such his observations tell us far more about the Myaamia practice of warfare than about the nature of civil leadership. Despite these initial misunderstandings, Perrot continued to interact with the Myaamia and other refugee groups, and he continued to learn. He became much more fluent in all of the languages of the region. By 1701, he was capable of serving as a translator for a negotiation that involved numerous languages. We can reasonably guess that he eventually came to better understand the cultures of these groups, but without his writings we will never know for sure. Throughout the 1670s and 1680s, Perrot and other Frenchmen continued to trade firearms and metal weapons for furs and continued to work to unify the refugee groups in order to push back the Haudenosaunee. Eventually this new alliance was successful and by the 1690s the Haudenosaunee were suing for peace. Perrot then helped to bring this violent conflict to a close by helping to arrange a massive treaty negotiation in Montreal in the year 1701. In the summer of 1701, ambassadors representing 38 tribal nations arrived in Montreal to bring 60 years of warfare to an end. As many as 3,000 representatives arrived over a span of weeks. The negotiations were quite lengthy as each nation’s representative delivered speeches on their community’s behalf. After a month of speeches, negotiation, and the ritual exchange of gifts the leaders shared a pipe filled with ahseema – tobacco – to symbolize their commitment to peace and their recognition of the French as a new “father” figure among an extended family of elder and younger siblings. This new “father” would be responsible for mediating disputes within the family and providing for the material needs of his “children.” In return, our ancestors promised to heed the advice of their father and avoid conflict amongst siblings as much as possible. The negotiations closed as the French had each of the leaders affix a mark to a treaty parchment – the European symbol of peace (see below). To my knowledge this is the oldest surviving document that our ancestors had a hand in creating. The mark of the Myaamia leader Chichicatalo (#18 circled in blue) probably represents a Sandhill Crane. Ceecaahkwa – the Sandhill Crane – has long been a symbol of our people and today it occupies the center of the national symbol of the Miami Tribe of Oklahoma. Sadly, Chichicatalo contracted an unknown illness during the negotiations, and he died on his journey back to his people. His efforts, and the efforts of many others, did allow our ancestors to return to their beloved homelands along the Waapaahšiki Siipiiwi – the Wabash River Valley. We can only imagine the honors they must have paid to the memories of those, like Chichicatalo, who sacrificed to make that return possible. The signatures of other near relatives can also be seen on this document: the mark of the Peeyankihšia (Piankashaw) leader is a scalp pole (#17); the mark of the Waayaahtanwa (Wea) leader is possibly a rock quarry (#27); the mark of the Peewaalia (Peoria) leader is a long tailed turtle (#21); the mark of the Kaahkaahkia (Kaskaskia) leader is possibly a notched feather (#26); and the marks of three other Inoka leaders can also be seen circled in blue (#’s 20, 22, and 23). The two signatures circled in red are the marks of two Tawaawa (Ottawa) leaders. Today all three of these groups – the Myaamia, Inoka, and Tawaawa – are represented in Miami, Oklahoma. The picture from 2009 Stomp Dance is a great symbol of the constancy of our interactions with each other. 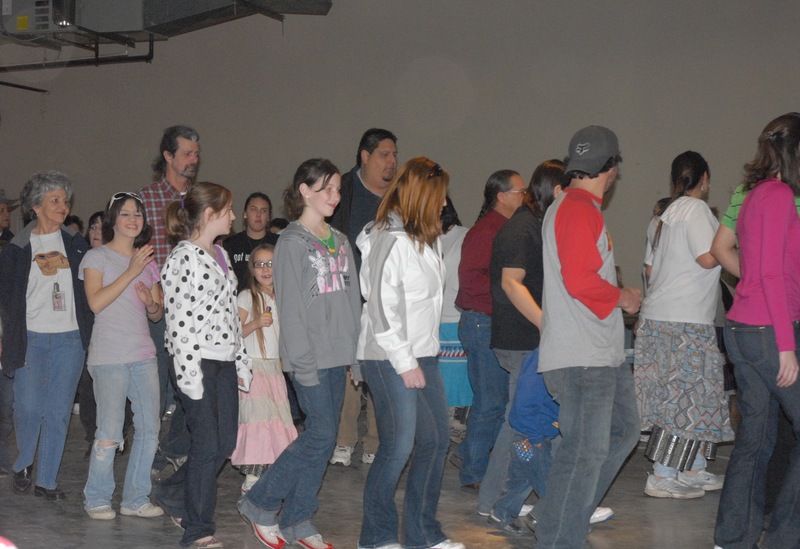 The gathering occurred in the Ottawa-Peoria Cultural Center and Kevin Dawes, an elected leader of the Ottawa Tribe, led this particular dance. In the crowd you can find many folks related to those who signed the Great Peace. For over three hundred years our peoples have worked together, and hopefully that is another tradition will continue on for at least another three hundred years. Likely the location of this encounter was on the southern most tip of Lake Huron, where groups have long traveled from the lake into the St. Clair River which takes one to Lake St. Clair and south from that lake to the Detroit River and thereby into Lake Erie. From Lake Erie travels often entered the Tawaawa Siipiiwi (Maumee River) and eventually portaged overland at the site of Kiihkayonki (Ft. Wayne) into the Wabash River Valley. C. C. Trowbridge, W. Vernon Kinietz, and Burton Historical Collection. Meearmeear Traditions (Ann Arbor: University of Michigan Press, 1938), 7. The same death rates are described in the east among the Haudenosaunee in this same period. Additionally, small pox most commonly kills adults leaving the elderly and young in a position to survive, if they have someone to provide them with care: bandages, fluids, and food. But the loss of adults made it difficult for those who might have survived to get the care they needed. See Richter The Ordeal of the Longhouse, 58-59. For more on small pox and its early history in North American see Fenn, Pox Americana, 13-43. Rafert, The Miami Indians of Indiana, 3. Helen Hornbeck Tanner and Miklos Pinther, Atlas of Great Lakes Indian History(Civilization of the American Indian series; v. 174. 1st ed. Norman: Published for the Newberry Library by the University of Oklahoma Press, 1987), 32-33. Richard White, The Middle Ground: Indians, Empires, and Republics in the Great Lakes Region 1650-1815 (Cambridge: Cambridge University Press, 1999), 6-7. Rafert, The Miami Indians of Indiana, 4-5. Bert Anson, The Miami Indians (Norman: University of Oklahoma Press, 1970), 4-6. Claude-Charles Le Roy de La Potherie, “The Adventures of Nicolas Perrot, 1665-1670,” in Louise P. Kellog ed., Early Narratives of the Northwest, 1634-1699. (New York: Charles Scribner’s Sons, 1917), 86; online facsimile edition at http://www.americanjourneys.org/aj-046/. Accessed July 11, 2007. La Potherie, “The Adventures of Nicolas Perrot,” 87. See white for a discussion of the rise of the influence of war chiefs in this period. Richard White, The Middle Ground: Indians, Empires, and Republics in the Great Lakes Region 1650-1815 (Cambridge: Cambridge University Press, 1999) 169-71. I am delighted to encounter your blog. I appreciate the quality of your work very much. I find very interesting; I volunteer at the museum in North Manchester, Indiana, and we are searching for information about the French connection to and influence on the Miami Indians in our area for an exhibit. What is your connection to the tribe and where do you live? aya Gladys, I’m a citizen of the Miami Tribe of Oklahoma and work for the Myaamia Center at Miami University in Oxford, OH. I’m member of the Strack family, who can be found all over the Fort Wayne area as well as the Chicago metro area, but I make my home in Oxford.